We often take for granted the natural resources as well as the pipes, pumps and people that deliver safe and reliable water and wastewater services to our home and businesses each day. 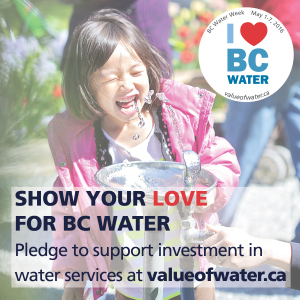 Take a moment to celebrate the value of our water resources and systems during BC Water Week from May 1-7, 2016! While water is provided by nature, there is a real cost for the pipes, pumps, equipment and people who ensure it is safely delivered to our taps and returned to the environment every day. Aging infrastructure, population growth, strengthened regulations, seismic hazards, and climate change are driving the need to invest in upgrades and renewal of our water systems. If we aren’t willing to pay for these essential systems, our health and prosperity will be at risk. 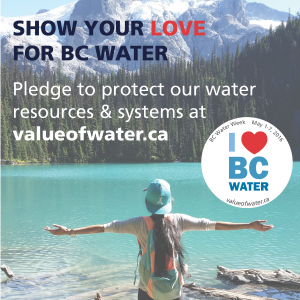 Show your love for BC water! We are all stewards of our water systems, for this generation and the next. Help protect our source waters from pollution, practice water conservation, and encourage our elected officials to make water and sewer system renewal a top priority for community investment. Take action and sign the pledges to Protect, Conserve and Support our water and water systems. When you sign one of the pledges, you will be entered into a draw to win one of three Whistler weekend prize packages from Tourism Whistler! Sign all three pledges and you will receive three entries into the draw! Take the pledges to Protect, Conserve and Support our water and water systems! Host an event in your community to celebrate your local water resources and systems and post your event details to our event calendar.